A 28 year old patient, a chronic alcoholic came with complaints of severe abdomen pain of 5 days duration and recurrent vomiting. An erect Xray of Abdomen showed Air under diaphragm. 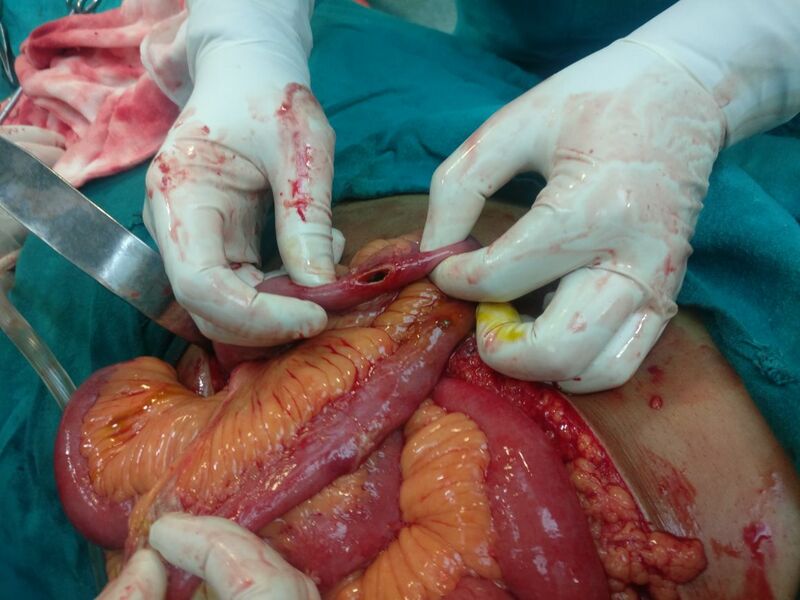 He gave a history of binge drinking 7 days back, which made us suspect a Gastric/ Duodenal Perforation. A separate history of fever or malaise before onset of abdominal pain was unclear. Laparotomy was performed by midline incision. On inspecting, we found two perforations in ileum about 15 cm apart, the distal one was about 30 cm from ileocaecal junction. The approximate diameter of proximal perforation was 0.5 cm and the distal perforation was 2 cm. Both the perforations were on the antimesenteric aspect of ileum. 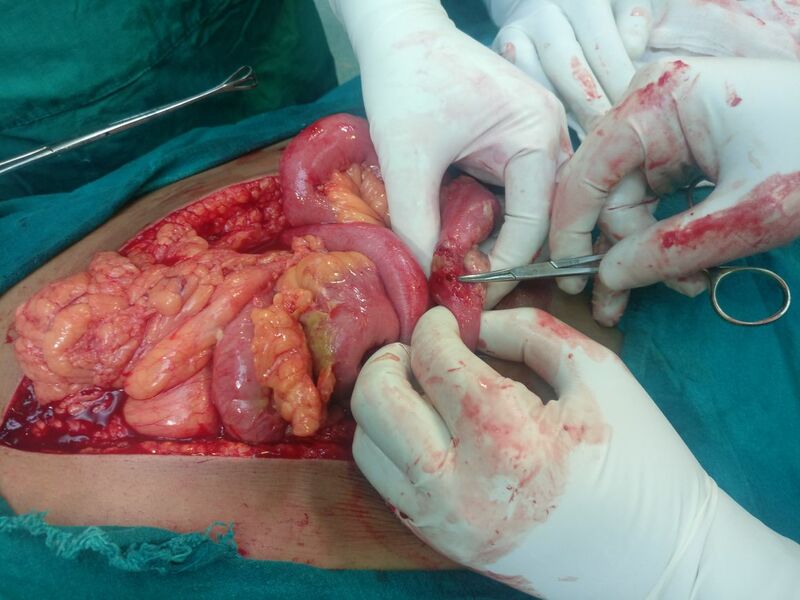 The abdominal contamination was moderate and there were pus flakes dispersed in subhepatic space and right iliac fossa, these were taken out as much as possible. The ileal loop was isolated and a thorough abdominal wash with warm saline was given. 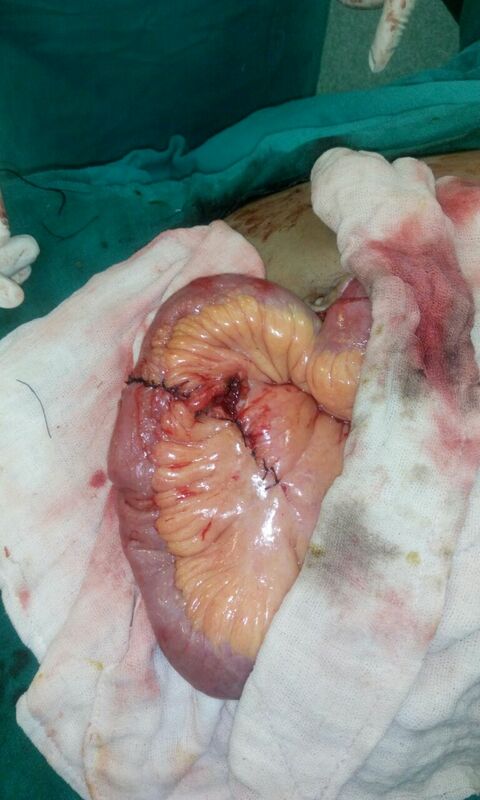 Finally a Segmental Ileal Resection was performed followed by a Hand Sewn End to End Anastomosis. Drains were inserted into both Right and Left Iliac Fossae. Post operatively, typhoid fever diagnosis was verified serologically. Patients was put on a third generation cephalosporin along with other supportive and symptomatic treatment. Condition of the patient improved and he passed stools on 5th postoperative day.